CELEBRATE ALL THINGS CIDER AT CIDERFEST! 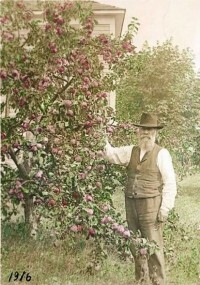 Cider has deep roots in American history. In colonial times, hard cider was by far the most popular alcoholic beverage, far more than whiskey, wine, or beer. Apple orchards were planted throughout the states, not for eating but for making cider. Many small farms grew cider apples and produced cider, sometimes supplementing farm worker wages with the fermented product. Why cider lost popularity in the US is up for scholarly debate, but as more people look to eat local, support sustainable agriculture and help small farms grow artisan crafted local ciders are growing in popularity. Vashon is home to many small farms, specialty orchards and talented cider makers. Even the casual gardener has apple and pear trees growing in their yards and probably has a cider press in the garage. 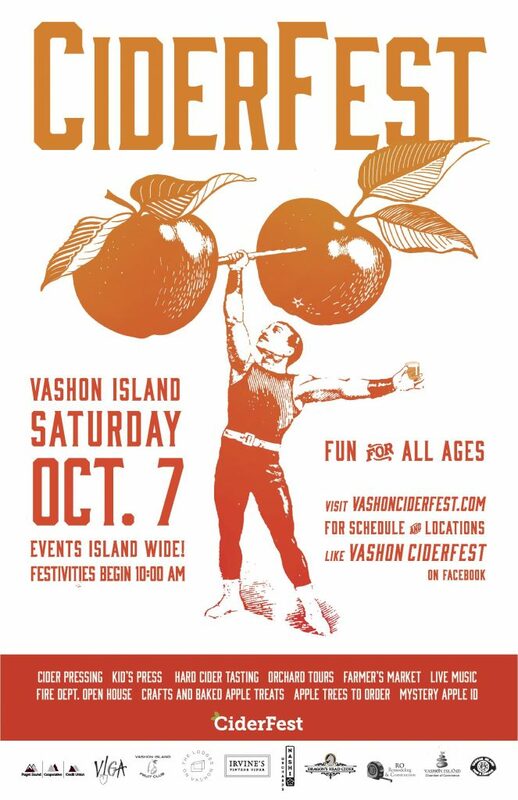 Join us on Saturday October 7th for Vashon’s CiderFest as the Vashon community celebrates of all things cider! The Vashon Island Fruit Club will be pressing Vashon grown apples and selling fresh cider and homemade apple crisps! Kids will get a chance to press apples with the Kid's Press. The Fruit Club will be selling Hot Apple Cider and home made Apple Crisps. A perfect way to start the fall season. BYOA! Bring your own Apples (not picked up from the ground) and use the VIGA Cider Press to make your own fresh Cider. VIGA will provide containers and experts on hand to show you what to do. Free, but donations are accepted. Vashon Island Fruit Club experts Emily MacRae & Dr. Bob Norton will be on hand at the Farmer's Market to help you identify your mystery apples. Bring 3 to 4 samples of each for identifying. Also if you want to start growing your own fruit the Fruit Club will be taking orders for trees specially selected to grow well on Vashon Island. Fire Station 55 at 10020 SW Bank Rd. Stop by Vashon Island Fire and Rescue will have their Annual Family Open House at Fire Station 55. Stop by to visit with local Fire & Rescue staff, enjoy, hot dogs, bouncy houses, fire trucks, an, air lift demonstration and other fun activities. NASHI ORCHARDS TASTING ROOM & ORCHARD TOUR! Take a tour of Nashi Orchards to see what makes their Cider & Perry so special. DRAGON'S HEAD TASTING ROOM & ORCHARD TOURS! Tour the orchards of Vashon's own Dragon's Head Cider! Entrance is $15 and includes a CiderFest tasting glass, and 5 tickets for tasting the various ciders. Must be over 21 years old. The Vashon Island Growers Association will be hosting the Hard Cider tasting as a fundraiser for their organization. The tasting event will feature ciders from orchard based cideries that focus on selecting high quality apple varieties for their ciders. Dragon’s Head Cider, Nashi Orchards, Snowdrift, Alpenfire, Liberty Ciderworks and Whitewood Cider will all be pouring samples. Food by Pink Tractor Farm. Live music by Fendershine and Some'tet. Look for CIDERFEST SPECIALS at local restaurants, galleries and stores!